If I had a farm, this is how I'd eat asparagus. I would plant lots of asparagus, and every spring I would collect bunches of beautiful green spears. 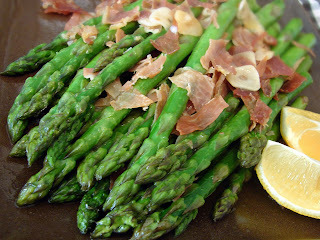 I would ignore the calendar - for me, spring would begin each year on the day I cut my first asparagus. I would plant rows and rows of garlic. I would never have to buy garlic, or worry about being out. I would never stop being amazed at how every year's crop tasted a little different from the last. I would raise hogs for so many reasons, not the least of which would be to cure my own ham. I would hang them in a dark cool cellar, and peak at them every day. I would plant a lemon tree in just the right spot, so the warm summer breeze carried the blossom's sweet scent through the kitchen window. If I had a farm, this is how I'd eat asparagus. Enjoy. I think this is your 4th post since April featuring asparagus. I sure wish I was living in your area with access to such great produce. Still, you must be getting odd looks when you use public urinals by now. In Florida I had 2 Myer Lemon trees and several orange trees. I loved them. I would pull off 2 lemons everyday and make the best glass of lemonaide. It was wonderful. This definitely looks like a side for later this week! "Indeed, to me a wood without pigs is like a ballroom without women"
I love how it feels like "oh, i still gots some asparagus- i'll make another asparagus dish for everyone :D!" instead of "i practiced this in a test kitchen a million times and it looks easy (because i've been cooking for 60 years) but i know it's way too hard for the audience to do- MWAHAHAHAHA-"
Ijust adore the simplicity :) thanks again! I agree. I love this kind of thing. It looks great, simple, and tasty (no joke!). Looks destined to be a favorite of mine. I can imagine my kids really loving it, all the while cursing your name to the ends of the Earth. I made the asparagus pie last week. Quite tasty. I made this as a side for dinner. Absolutely delicious, gotta try some parmesan sprinkled over them some time. Thanks for sharing! I enjoyed it as well. Great for beginners! A beautiful essay on "if I had a farm". (Please see my food wish of Tres Leches Cake) That would go good with the ham & asparagus. I also make a stove top green beans with ham, mushrooms, cream of mushroom soup and shredded cheddar cheese with almonds sprinked on top that is good. Mine turned out reasonably well, despite the stalks being almost 2 cm in diameter. By the way, you forgot the 1/4 cup of water in the ingredients list.